The exhibition, Hank Bull: Connexion was based on Vancouver-situated artist Hank Bull's archives, collected beginning in the early 1970's and displayed by the artist himself in 2012 at the artist-run center for contemporary art and new music, Western Front. 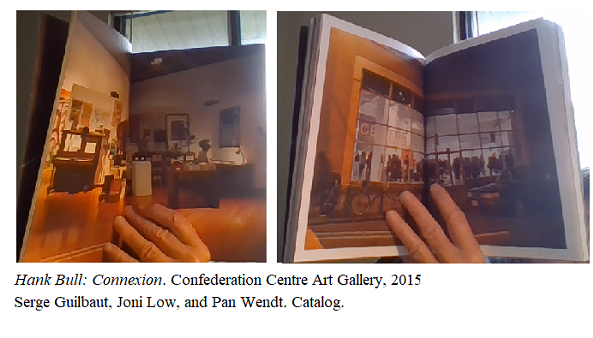 In 2015, curated by Joni Low and Pan Wendt, Hank Bull: Connexion was installed at the Confederation Centre Art Gallery in Charlottetown, Prince Edward Island, Canada. From January 20 to April 6, 2017, Hank Bull: Connexion returned to Vancouver, BC, Canada, where it was installed at the Burnaby Art Gallery. Hank Bull's work resides at the intersection of painting, sculpture, music, performance art, video, sound, radio, and telematic art. Beginning in the 1970's, he was associated with Western Front, and in 1999, he was a co-founder of the Vancouver-based International Centre for Contemporary Asian Art (Centre A). In the second decade of the 21st century, where the darker sides of global contemporary social media dominate discourse, the catalog for Hank Bull: Connexion -- infused with images and texts from his work and philosophies, as well as containing primary essays in both French and English by Serge Guilbaut, professor of art emeritus at the University of British Columbia; independent curator and writer Joni Low; and Pan Wendt, curator at the Confederation Centre Art Gallery -- provides an entry way for revisiting artists' projects in the formative years of social networking. Interactive approaches to radio were a starting point for Bull's work with communications, but from a Networked Projects in the Formative Years of the Internet point of view, the story begins when he began working on artist-centered telecommunication projects in the 1970's, utilizing slowscan, electronic text, and fax. In the 1980's, using Canadian carrier I.P. Sharp's ARTEX platform, he was a core participant in projects such as Roy Ascott's La plissure du texte (1983), a collaborative fairy tale written in English and French by nodes including Vancouver, Sydney, Vienna, Amsterdam, Bristol, Boston, Pittsburgh, New York, San Francisco, and Honolulu, among others. "The Magician," British artist Roy Ascott, was at that time based in Paris. As the narrative progressed from node to node, an improvised, collaboratively-created text emerged. La plissure du texte was documented in the exhibition Hank Bull: Connexion with a printout bound in string. The catalog situates material from the exhibition in a click-bait-reminiscent array of entryways to Bull's work that suggests multiple interpretations and in the process, explores the roots of social networking in artist-centered communication circles. Beginning with the HP Dinner Show, (radio, with Patrick Ready, 1976-1984), in the catalog, an "Illustrated Chronology" by Bull himself sets forth projects such as Telephone Portraits (Taki Sekiguchi and others, 1977); Canada Africa 1.1 (conceived by Robert Filliou,1983); and Weincouver IV (Robert Adrian, Hank Bull, and others, 1983). Additionally, foreshadowing the role of social media in global politics -- such as the 2008 Facebook Group Un Millon de Voces Contra Las FARC or the Iranian voices on Twitter in protest of the 2009 Iranian presidential election -- in his chapter in Social Media Archeology and Poetics Bull describes how an "Art's Birthday" celebration evolved into networked protest. The role of "host" in early nonprofit social media was, in many cases, conceived differently from the role of "moderator" in that there was no censorship or hierarchical consideration of participation in the idea of host. Ideally, a host welcomed and facilitated democratic discourse. However, varied interpretations of the-role-of or the-need-for "hosts", were, are, and will continue to be areas to review and discuss as we look to the future of social media. For instance, in a larger sense of "host", in many of the projects initiated by the Electronic Cafe -- such as at the 1984 Olympics, where diverse communities were linked in cafes across Los Angeles -- Kit Galloway and Sherrie Rabinowitz could be considered the hosts, in that they provided the technology and created the environment. The same could be said of contemporary social media platforms, such as Facebook and Twitter. However, they are large commercial entities, whereas The Electronic Cafe was an artist-run project. For ARTEX, the Canadian time-sharing telecommunications carrier I.P. Sharp (IPSA) provided the technology, but projects were initiated by the artists themselves who served as host for various projects. A model was Bill Bartlett's 1979 Interplay, carried by IPSA, as a part of the Computer Culture Exposition at the 1979 Toronto Super8 Film Festival. During Interplay, from node to node, artists in Canberra, Edmonton, Houston, New York, Toronto, Sydney, Vancouver, and Vienna discoursed on future roles of computer culture, and, as the discussion progressed, computer printouts of their dialogue appeared in the participating cities. Other artist-hosted projects hosted by IPSA included Robert Adrian X's The World in 24 Hours (1982); and Norman White's hearsay, a tribute to Hungarian-born poet Robert Zend, in which, following the sun, a text was sent around the world in a 24-hour time-based event (1985). Hank Bull not only was a core participant in many of these projects but also served as a host/catalyst to inspire and provide platforms for projects on other systems. In the 1990's, on Arts Wire there was also an overall management that provided the technology and the environment, and, in an overall sense, hosted "interest groups" that were proposed, developed, and hosted in different ways by different individuals or organizations. For instance, AIDS and LGBT activist Michael Tidmus developed and maintained AIDSwire. Composers Pauline Oliveros, Douglas Cohen, and David Mahler hosted NEWMUSNET, a virtual space that centered on issues about/for composers, performers and presenters of experimental music and served as an incubator for new ensembles and new works. Anna Couey and I developed and hosted INTERACTIVE, an online laboratory for focused discussion and production of interactive art. Funded by the Nathan Cummings Foundation, the NATIVE ARTS NETWORK ASSOCIATION (NANA), a group of Native Arts Organizations, had core involvement from Atlatl in Phoenix. PROJECTARTNET -- created in 1993 by Aida Mancillas and Lynn Susholtz -- was a San Diego-based community arts networking project that brought children from schools in immigrant neighborhoods online to create a community history. On contemporary commercial social media, the richness of content and dialogue that existed on early social media systems is there, but it is often diluted and difficult to find. Additionally, in defense of contemporary social media platforms, it should be noted that we don't see many big media outlets in other broadcasting systems (television, for instance) offering free platforms with a potential for equality to everyone in the world. Nevertheless, not only should the issues of Big Social Media as monopoly hosts in the provide-the-technology-and-the-environment/interface sense be debated, but also there is a need to incubate nonprofit alternatives where management does not own or misuse content -- particularly in the arts, where censorship is seldom appropriate, and unseen algorithmic censorship is insidious. If this were an in-depth essay on the roles of hosting/moderation/management in profit as opposed to nonprofit social media platforms, this would be the time to examine this issue from the point of view of (for instance) Facebook groups, Twitter hashtags, and management's algorithic control of content. 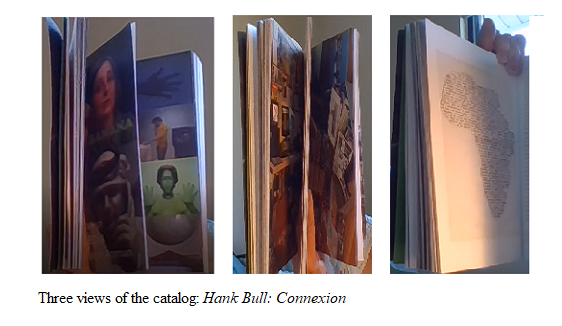 Meanwhile, what is core in this review is that publications such as the catalog for Hank Bull: Connexion, as well as Bull's extraordinary archives themselves, are vitally important in such discussions because they allow us to look not only at art history per se but also at the models that both individuals and organizations developed in the nonprofit era of social networking. In "Style de vie", the concluding section of Hank Bull: Connexion, Joni Low, Alex Muir, and Pan Wendt arrange a series of images and lexias (in both English and French) that ground the exhibition and catalog in conversations in Hank Bull's apartment at Western Front during the years that led up to these events. The wind dislodges and breaks Yuxweluptun Lawrence Paul's wooden sculpture (made for the roof of Western Front at Hank Bull's request), and the sculptor�s surprising reaction is remembered; noise makers of all kinds are strewn on top of a piano, eliciting discussions of noise, music, and telematic communication; "Stories intermix and misunderstandings become openings for reinterpretation. Humans, like vessels, hold and spill stories along the way, sometimes accidently, other times deliberately. Follow the clues..."
1.Hank Bull, "DictatiOn: A Canadian Perspective on the History of Telematic Art", in Judy Malloy, ed., Social Media Archeology and Poetics. Cambridge, MA: MIT Press, 2016. pp. 127-138, 133. 4. Susanne Gerber, "Crossing-Over of Art History and Media History In the Times of the Early Internet with Special Regards To THE THING NYC" in Judy Malloy, ed. Social Media Archeology and Poetics. Cambridge, MA: MIT Press, 2016. pp. 309-332.